Ticket sales in China may have been disappointing but passion for the World Cup is stronger than ever as record numbers tune in to TV. Tang Yue in Beijing reports. When Wang Wen sat down in front of his small, black-and-white television to watch Argentina take on Holland in the 1978 World Cup final, it changed his life forever. It was the first time the tournament had ever been broadcast on China Central Televison and, for him, it started a love affair with soccer that has taken him across the globe. "I didn't believe anything could be so exciting," he said. "I was glued to the television set, and when it finished I couldn't wait until the next event." Ever since watching the dazzling skills of Osvaldo Ardiles and the scoring prowess of Mario Kempes - he netted twice to help hosts Argentina win 3-1 - on the small screen 32 years ago, Wang has had only one goal: To watch a World Cup final from the stands. On July 11 in Johannesburg, that dream will finally come true. Although ticket agents say sales for this year's finals in South Africa have been disappointing, Wang, 52, will be among thousands of Chinese fans who will fly out to enjoy one of the most important events on the sporting calendar. 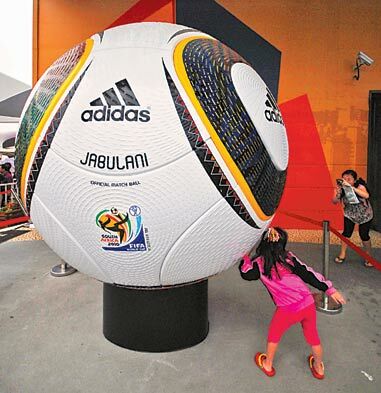 "When I was younger, I didn't dare to dream of watching the World Cup," said the advertising manager from Beijing. "Not many Chinese could afford to go abroad in the 1970s, let alone travel to watch a soccer game." Times change, though, and Wang has now traveled to watch the last three World Cup finals. In 1998, he traveled to France to see Germany take on the United States, and four years later made the short trip to South Korea (co-hosts with Japan) to witness the Chinese national team's debut in the competition (they lost every match and failed to score a goal). And in 2006 he also flew to watch the finals in Germany. "Once you start going (to World Cup finals), you just can't stop," said Wang, who is president of the Beijing Soccer Fans' Association. "Nothing is more exciting than being there to watch the best players beside the best fans from all over the world." However, this year will be the first time he has got a ticket for the championship match - which pundits suggest could potentially be contested again by Argentina and Holland. 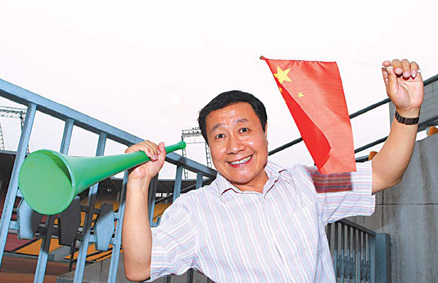 In 1998, Chinese fans "had no choice at all but to accept tickets for the few matches offered by FIFA (the sport's governing body)", said Wang, who has spent about 54,000 yuan ($8,000) on his seven-day trip to South Africa and will be accompanied by 10 friends. More than 1,400 match tickets have been snapped up in China, most as part of tour packages, authorized agents told China Daily. Although that figure does not include tickets booked through FIFA's website or official sponsors of the event, who receive complimentary seats at games, agents say overall sales fell far short of expectations. China's failure in qualifying for the finals, as well as the distance fans need to travel, are among the factors being blamed for the slump. 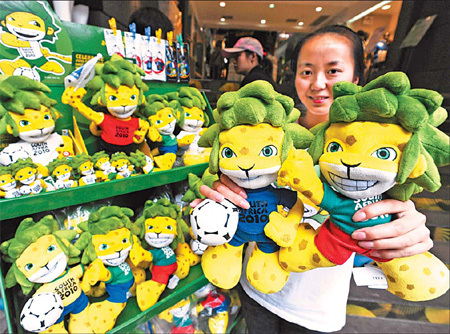 China Sports Industry Group, the country's exclusive 2010 World Cup tour operator, pre-booked 1,000 tickets for matches at different rounds and bought another 1,000 tickets transferred from the Democratic People's Republic of Korea, who will play Brazil, Portugal and Cote d'Ivoire in Group G.
But company vice-president Wang Qi said roughly only half of both sets of tickets were sold. He added that about 100 other fans also successfully booked the tickets for matches through the FIFA website but had "regretted the purchase and attempted to sell the tickets to us". 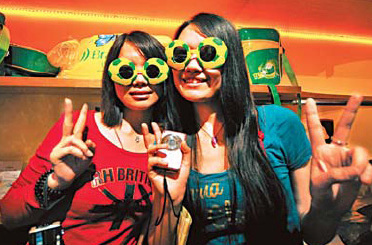 The company sold more than 1,000 tickets in China for the finals in France in 1998, and about 2,000 for Germany in 2006. Sales hit a peak in 2002, though, when more than 20,000 Chinese fans traveled to cheer on their team in South Korea and Japan. As ticket sales have steadily increased, the demographics of who is buying them have changed dramatically, say industry analysts. "In 1998, most of the tickets were bought by companies and half of them were used as bribes," said Wang Qi. "But this has become harder as civil servants now have to report (to their supervisors) before traveling abroad. "Now more tickets are purchased by the real fans, and those bought by companies are more often used as prizes to attract customers," he said. "Real fans" have real jobs and real budgets, however, and many in China have been put off by the cost of traveling to the finals. "South Africa is too far away and accommodation there is very expensive during the World Cup," said Wang Qi. "Even during Spring Festival, an eight-day holiday in South Africa and Kenya is only about 12,000 to 15,000 yuan, compared to 30,000 to 40,000 yuan now." Soccer fanatic Wang Wen admitted this year's finals had cost him far more than previous events - 32,000 yuan for 16 days in France in 1998 and 23,000 yuan for 15 days in Germany in 2006. "I'm also planning to go to Brazil in 2014," he added with a smile. Public security in the African nation has also proved a concern for some people, including Wang Wen's wife. "No matter how many promises and efforts the South African government have made, it's hard to go there without any fear," he said. China may not have qualified for the 2010 World Cup, which officially kicks off on Friday when the host nation takes on Mexico, but that has done little to dampen the fans' enthusiasm. Millions are expected to tune in at home to cheer on their "second favorite team", with CCTV scheduled to broadcast all 64 matches on TV and on its website. Bars and restaurants will also show games. And even though the national team is absent, the country will still be well represented in South Africa. As well as being only the second finals to feature a Chinese match official (assistant referee Mu Yuxin was selected despite a recent match-fixing scandal that rocked the domestic game), it is also the first to be sponsored by a Chinese company: Yingli Green Energy. One of the world's largest manufacturers of solar panels, Yingli signed a deal in February to fit solar panels in 20 of FIFA's "Centers for 2010", one of the world governing body's main legacy projects in Africa. In return, advertisements for the company will occupy half of the field-side billboards for eight minutes at all 64 matches and will be seen by an estimated three billion people around the world. "China is emerging as a favorite hunting ground for sponsorship for sporting events and organizations, especially after the successful marketing campaign for the 2008 Beijing Olympics," said He Wenyi, director of the China Sport Industry Center. "Enterprises also realize the effectiveness of sponsoring international events, especially the Olympics and World Cup finals. "Messages conveyed through sport are better understood and trusted. They can easily break the boarders and build up a long-term brand image," said the marketing expert. The groundbreaking deal struck by Yingli was welcomed by other Chinese businesses involved in the World Cup, including managers at Hejun Sports Management, the Chinese mainland's exclusive agent for FIFA's Hospitality Program. Although prices are higher than other firms, ranging from 59,000 yuan to 198,000 yuan, Hejun Sports Management has already sold 400 tour packages to corporate customers. 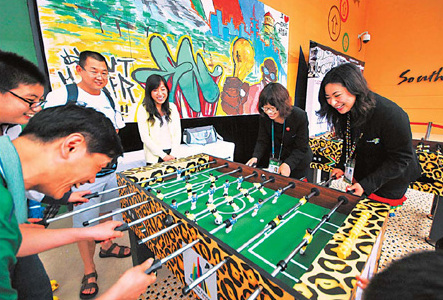 "The Hospitality Program was launched more than a decade ago," said Feng Tao, general director of the Hejun Sports Management. "FIFA didn't care much about the market in China at that time but that's changed." Feng, who worked for World Sport Group, Asia's leading sports marketing company, from 2001 until 2008, explained that the program is much more than an expensive tour package. It mainly serves as the intermediary between FIFA and potential investors, and China' s involvement in the program naturally helps to forge tighter bonds with the sport's ruling body. "Like every soccer pitch, (the business side of) soccer has its circle," said Feng. "It's not only about sport, it's a huge business and it's about politics. The program provides a very good chance for the Chinese to meet those who have clout. "We always talk about sponsoring the international events but actually (the country) has no experience, except at the 2008 Beijing Olympic Games, which was on home soil," he added. Although Yingli is sponsoring a specific event, China also still has no long-term FIFA partner, such as Coca-Cola and Visa. Experts, however, say there is no rush and warned that bigger sponsorship deals are not necessarily better. "It is not profitable for every company, at least not for those whose products are not sold abroad," said He Wenyi. "You have to have good timing. "Coca Cola and Visa are very big and are truly global brands. By contrast, Sinopec and PetroChina may be Fortune 500 companies but they are large monopoly State-owned enterprises and their market is at home," he said. "I don't think it would be wise for companies like them to spend big sums of money on such sponsorship."